Oh, brunch. That glorious meal enjoyed on a lazy weekend morning when calories don’t count and mimosas and Caesars are mandatory. When I was assigned to write about Kingston’s best brunch spots I think I let out a faint squeal in anticipation of eating all the eggs benny and huevos rancheros my little heart (and big appetite) desired. 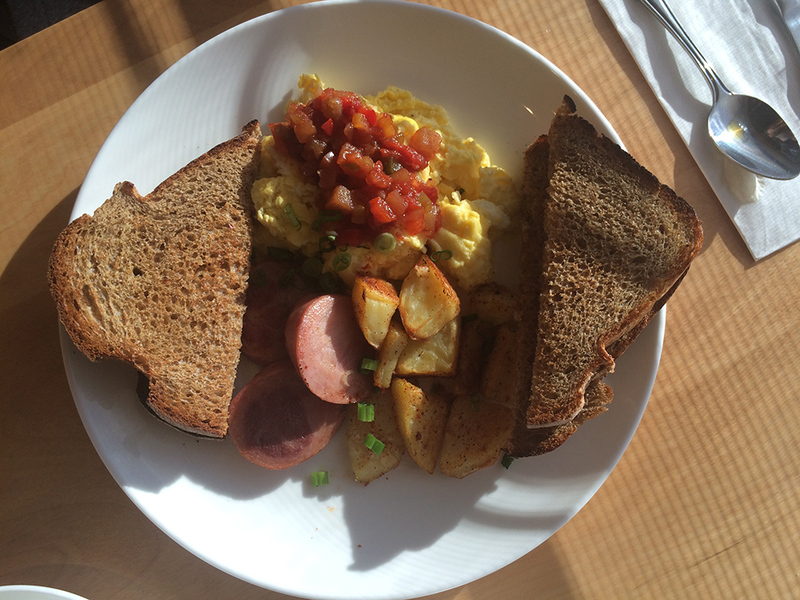 Kingston has so many delicious mid-morning meals to enjoy that I know this list is missing a few, but I tried my very best to round up the cream of the crop of locally owned brunch spots! 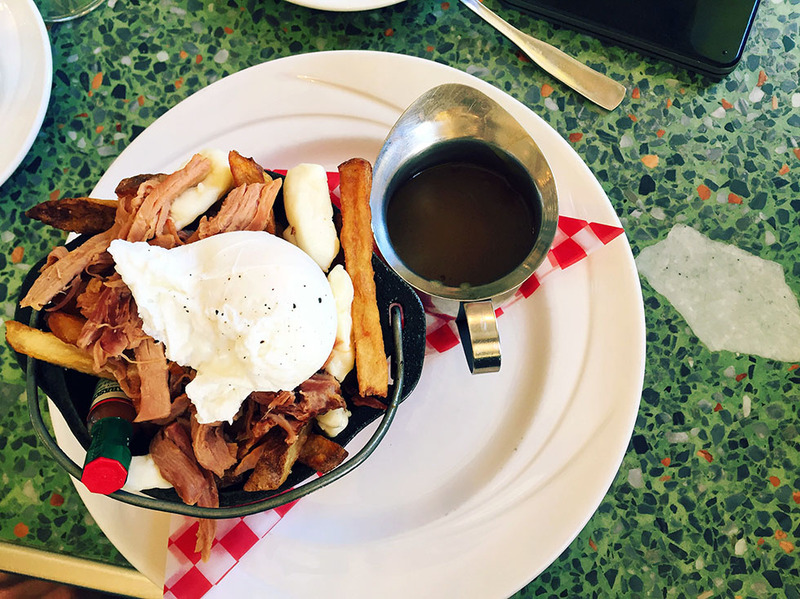 Pan Chancho-breakfast poutine – smoked ham, cheese curds, poached egg drowned in “red-eye” gravy. If you make your own bread and you’re a household name in Kingston, you shoot right to the top for best brunch. 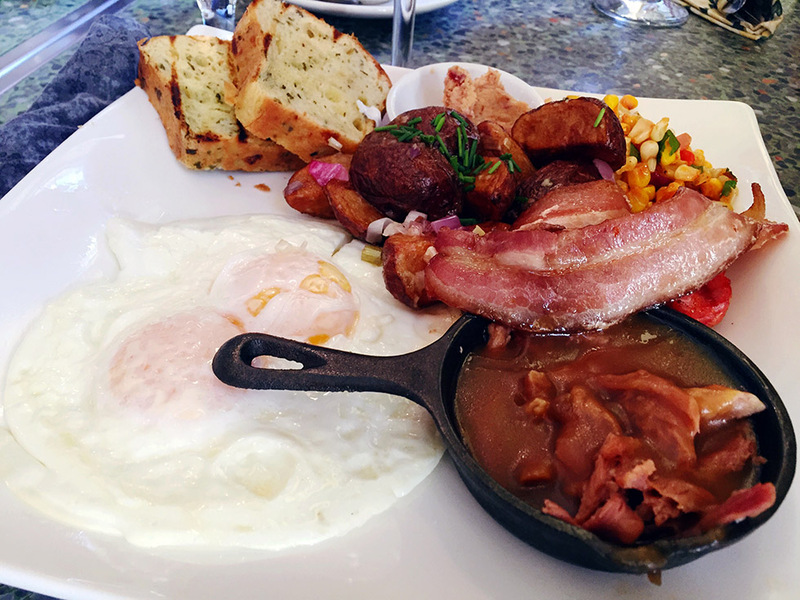 Pan Chancho’s El Chancho – bacon, chorizo, over easy eggs, roasted corn salad, lemon and thyme potatoes, caramelized onions, campfire gravy, grilled savoury brioche and bacon jam. Pan Chancho curates as many local ingredients as possible on top of making nearly everything from scratch. They are incredibly creative with their menu items and everything tastes so damn good. Most drool-worthy menu item goes to the breakfast poutine: smoked ham, cheese curds, poached egg drowned in “red eye” gravy. Aunt Sophies – 3 eggs scrambled with cheddar cheese, fried kelbasa, potatoes, and sweet chili sauce- toast. 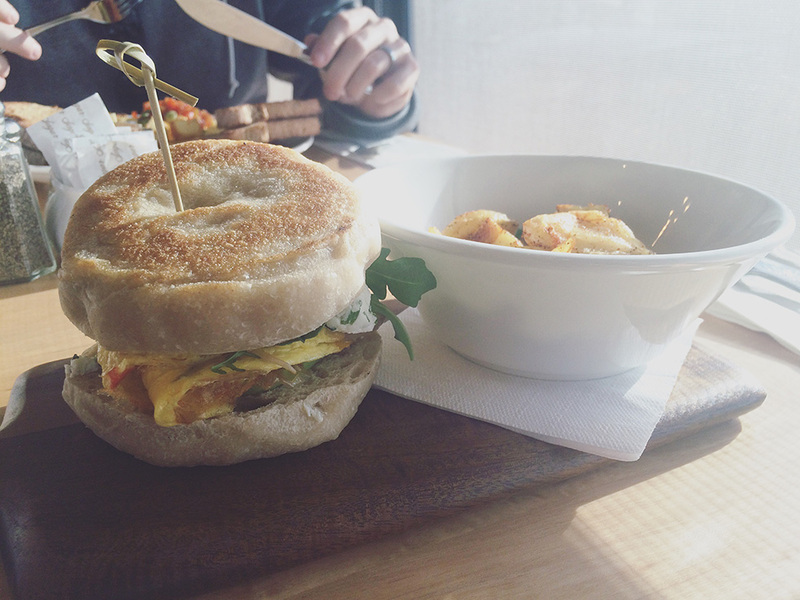 TJ Sandwich: avocado, peppers, arugula, egg, goats cheese, and house-made griddlecake. You don’t have to go all the way downtown to get quality ingredients. Toast and Jam has you covered with the most delicious menu items! 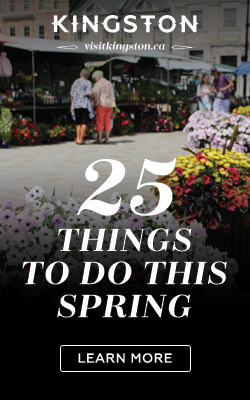 Everyone knows it, though, so maybe have a snack before you go because you might have a bit of a wait before grabbing your table – but don’t worry, it’s well worth it! There is something for everyone, but my favourite is the breakfast sandwich with avocado, peppers arugula, egg, goats cheese in a house-made griddle cake. Highlight: they bring small cookies with the bill. Such a treat! If you want to go old school, head over to Carmelindas! They’ve been in business for years and the food tastes the exact same every single time – delicious. Brunch here is what slow Saturday mornings are made of. Staff are laid back and friendly and the bacon is plentiful. The pancakes are amazing but I always get the cheap, cheerful, classic breakfast of two eggs over easy with bacon and buttered toast (and a slice of orange). Dianne’s the seafood spot? Who knew, right? Well, they do brunch and they do it well! They don’t offer traditional menu items, think items like breakfast tacos. Plus, they also serve their Caesars with a Lobster claw garnish. So there’s that. 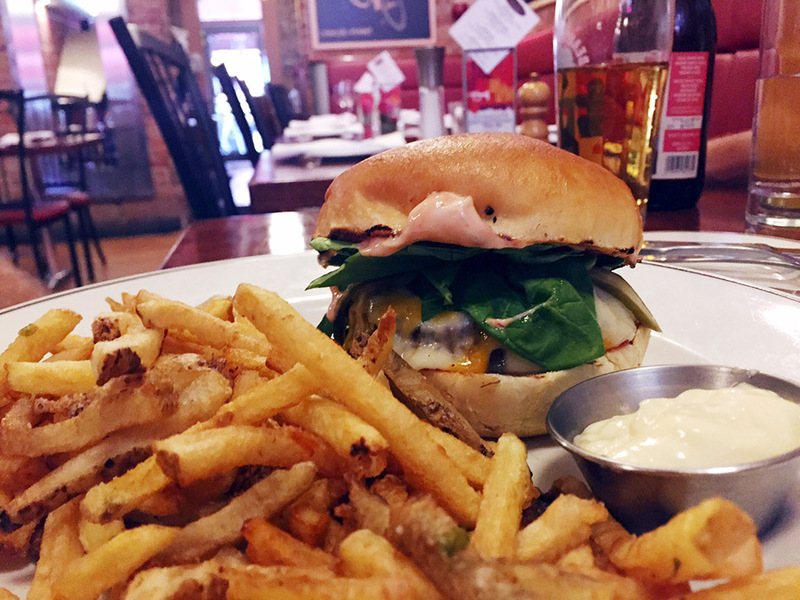 Open Saturdays and Sundays from 11:30AM to 3:00PM, Dianne’s brunch menu includes interesting concoctions like Dianne’s Brunch Burger and NS Lobster Rolls while still catering to brunch traditionalists with their spin on Eggs Benedict and Steak and Eggs. Pan Chancho supplies their bread, so they are already an easy choice. Chez Piggy only offers brunch on Sundays, which makes it even more enticing to me. 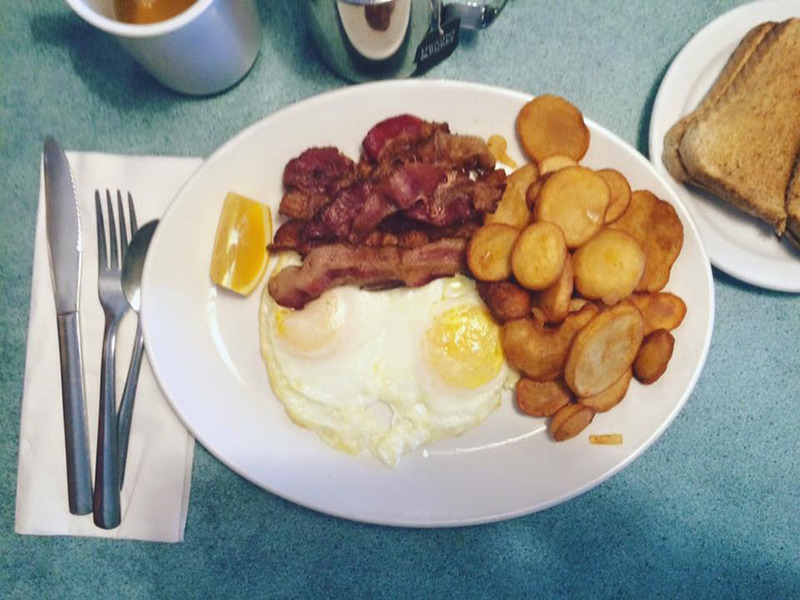 According to my server, the most popular menu item is the Lo-Cal High-Cal breakfast: bacon, peameal, sausages (house-made, of course), red fife toast, grape jelly, and home fries. However, I can’t take my eyes off of the Rock Crab Benedict. Yes, crab Benedict. 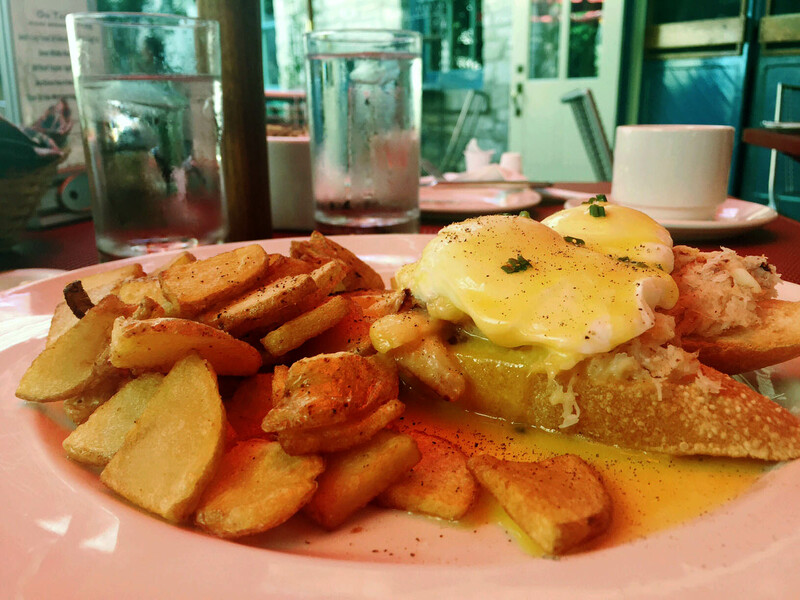 The sweet crab flavour smothered in a light Benedict sauce on a sliced baguette – too delicious. Huevos Rancheros: two fried eggs, veggie chili, home fries and crispy corn tortillas topped with melted monterey jack cheese. Perogies and home fries with added bacon (naturally). Windmills is another Kingston staple filled with delicious menu items sourced from local vendors. They also make a lot of ingredients from scratch like their perogies, served with two eggs and sour cream. 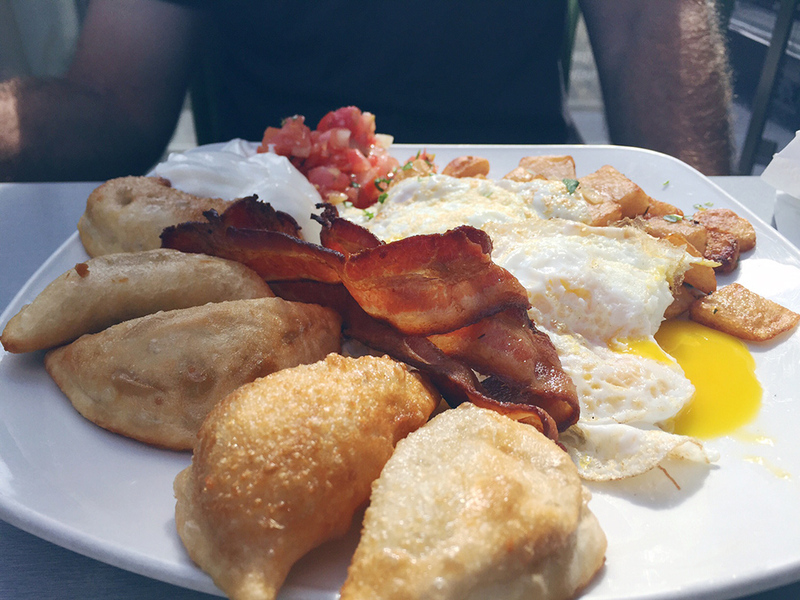 Have you had homemade, fresh perogies for brunch? Soft and crispy all at once balanced with a runny poached egg. Delightful. 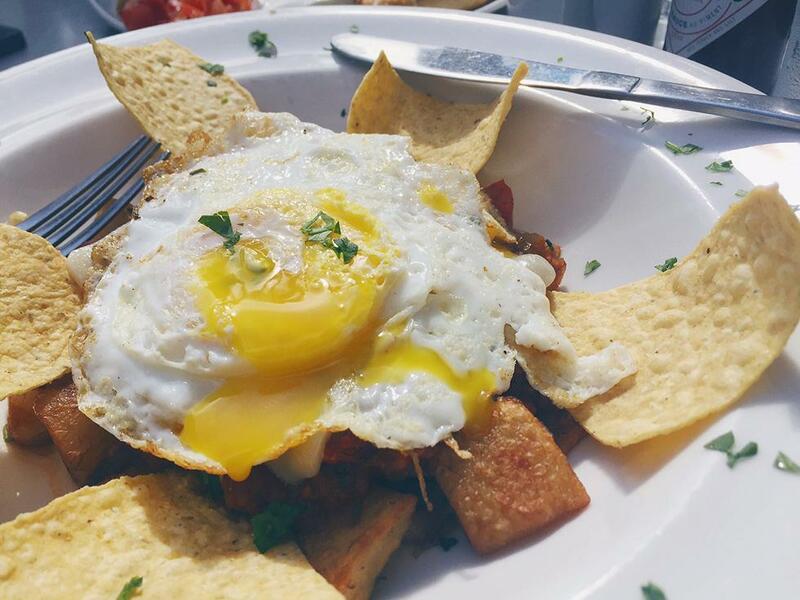 Another goodie on their menu that’s proven popular – huevos rancheros: two fried eggs, veggie chili, home fries and crispy corn tortillas topped with melted monterey jack cheese. The veggie chilli option is perfect for those who don’t eat red meat. The combo of eggs and chilli is a match made in brunch heaven. Le Chien Noir’s delicious breakfast burger. Going to brunch at Chien Noir puts a major spotlight on my indecisive nature. 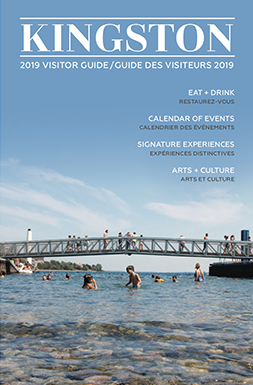 First of all their flavourful duck confit is featured on two mouthwatering menu items, duck confit eggs benny smothered in lemon-chardonnay hollandaise or poutine with Quebec brie, green peppercorn-cognac and you guessed it — duck confit. They also have a mushroom scramble which I am told is popular: hash browns, pancetta crisps, mustard creme fraiche, lemon oil, pea shoots and toast. How do I choose? Not to mention the french toast which has house-made peanut butter, Grand Marnier banana flambé, bacon whipped cream and house syrup. I honestly consider sharing the french toast for a brunch dessert because I can’t imagine leaving without tasting it’s sweet and savoury goodness! 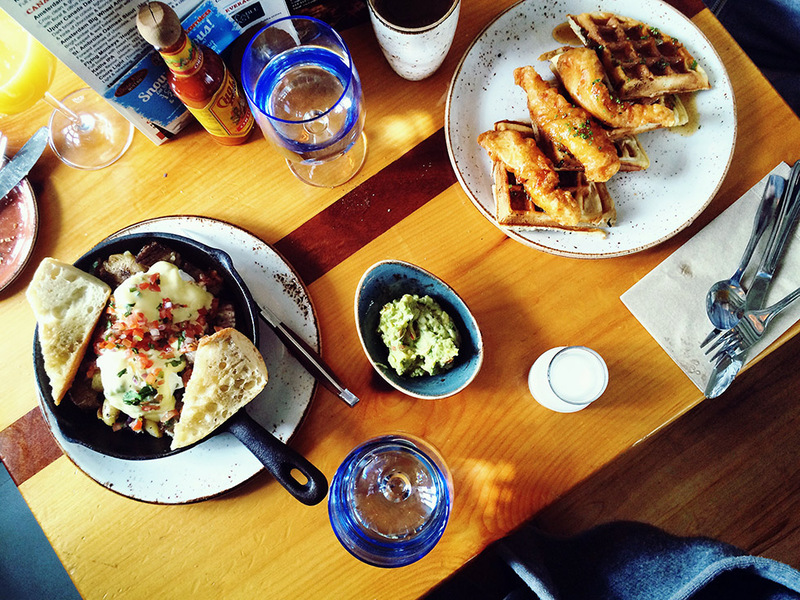 This brunch is for those ready to bust the budget, a total #treatyourself experience.